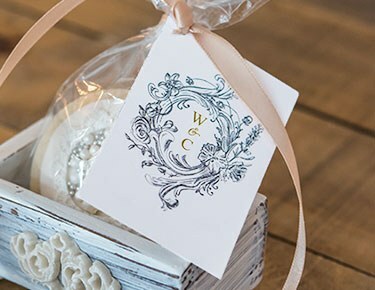 Attaching a personalized tag will both highlight your attention to detail and bring out a customized charm to your wedding, your reception and your ceremony items.Transform ordinary items into extraordinary keepsakes and thoughtful giveaways by simply attaching a tag with a pretty ribbon, twine, gold filament or raffia. 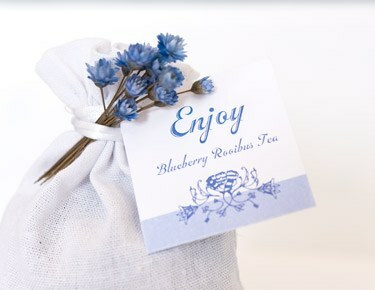 See how easy adding a personalized touch can be when you create a customized wedding favor tag at Weddingstar! 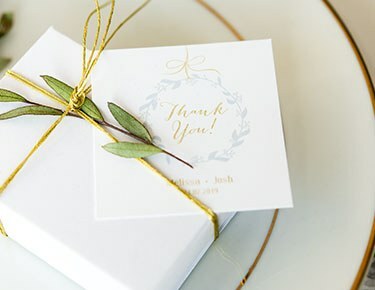 Shop our super-amazing selection of wedding favor tags and create something splendid with the help of our wedding boutique and favor tag ideas.Our wedding favor tags are ideal to add a touching detail to your place setting, tabletop decor, buffet as well as your drink tables! Use your imagination; the sky is the limit! Choose from various sizes, shapes, themes and designs. Find one that will best reflect your wedding's colors or motif, or that best reflects your personality and interests.Add these high-quality printed labels to glass bottles, bags, gifts, baskets and more. Our laser cut tags are available in various intricately cut designs that are gorgeous to look at and that add a touch of classic elegance. 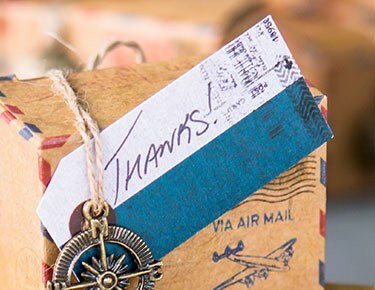 Choose from monograms, infinite heart designs, snowflakes and feather designs.For couples who live to travel, choose our themed "Well Traveled" vintage paper shipping tags with twine ties. Catch the travel bug with our "Global Destinations" vintage paper shipping tags with sweet ties that will attach these tags with style. 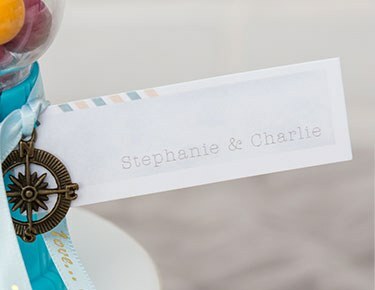 Or, opt for small rectangular favor tags with hot air balloons and compasses.Purchase square and rectangular favor tags in either one-sided or two-sided printing styles. 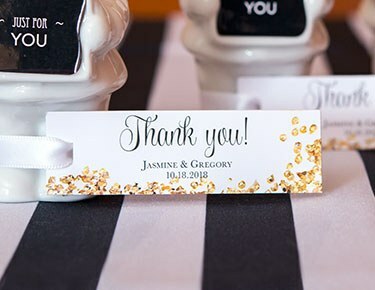 Our favor tags can be as simple or as intricate as you want - choose from different fonts, script types and more.Our customized wedding favor tags can add delightful touches to your items at a great price. 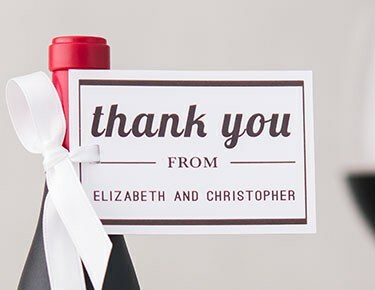 Adding thoughtful details to your settings, favor bags or bottles doesn't have to be prohibitively expensive. Choose details and designs that won't break your budget!